About 19,000 people in the collapsed Farepak savings club are now going to be sent Christmas hampers. Consumer Minister Ian McCartney said the goodwill gesture would see them delivered in the next week or so. The hampers, stored in Wakefield, were bought from the administrators of the firm after the Farepak Response Fund received some late donations. The hampers will have packaged and tinned food, sweets and drinks, but not fresh or frozen food such as turkey. Mr McCartney said: "It gives thousands of families something for Christmas when otherwise they might have had nothing." 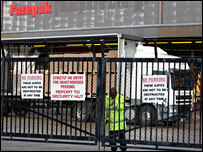 Although 23,000 hampers had been ordered by Farepak customers before the firm collapsed in October, the company itself had only bought the contents for 19,000 of them. That means that about 4,000 customers will still not get the hampers they had paid for. The ones that have now been bought will be sent out to 7,900 Farepak agents, who will have to decide how to distribute them to the customers. The Response Fund has already raised £6.4m, which has led to some members receiving shopping vouchers in partial compensation for their losses. The Treasury has confirmed that it will launch a review of how Christmas saving clubs operate after the collapse of Farepak. The Treasury Minister, Ed Balls, told MPs in the Commons that hamper schemes were "often poor value for money". He said a review would look into the implications of hamper debt schemes and savings clubs. He wants to see whether mainstream financial service firms could better meet the needs of their customers. The review, to be carried out by Brian Pomeroy, the chairman of the Financial Inclusion Taskforce, was first announced last week. Mr Balls told the Association of British Insurers then that the review would "look at the reasons why people opt to use hamper schemes and similar vehicles instead of mainstream financial services products". The review will report back in time for next year's Budget. The collapse of Farepak, in which 150,000 people are thought to have lost up to £50m, has highlighted the fact that these savings schemes are completely unregulated. Last week the Treasury Select Committee urged the government to do something about this. One suggestion has been that the Financial Services Authority (FSA) and Office of Fair Trading (OFT) should be given some sort of formal responsibility for regulation. This might make formal compensation possible in the event of a similar collapse in the future. The Farepak savers lost on average £400 each. Some Farepak savers are having to turn to doorstep lenders.